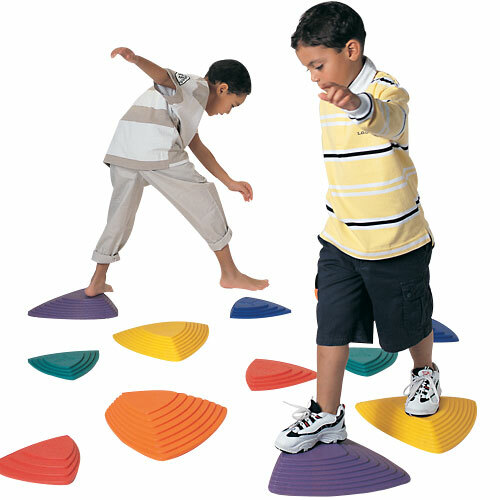 Stepping stones to better coordination, balance and fun. The River Stones are inspired by stepping stones in a river with each side of the triangle varying in steepness and difficulty. The purpose is to jump from stone to stone without touching the floor and you can vary the position of the stones to create more challenging paths for children. Each stone has rubber studs on the base, which prevent them from slipping, and also protect indoor floor areas. Provides challenging, active, imaginative fun. Builds children’s confidence when jumping, judging distances, developing coordination and balancing. Maximum weight capacity approximately 110 lbs. Each set includes 3 big stones 1’ 2" wide by 3" high and 3 small stones 10" wide by 2" high. Each set includes 1 of each color: Blue, Green, Orange, Purple, Red and Yellow.